What's the easiest way of putting a fixed-width space? Instead of \enspace that makes a space of 0.5em, you might want to use a smaller one. The big advantage of using macros is that you can change the overall appearance just by acting in a single place. put the dialogue in a group and put \RaggedRight in it. This will flush everything to the left. I would recommend to write a command or environment for this. But this will have no indent if you start a new paragraph. Would you use the unicode em-dash? In that case you can use some magic. Any line starting with — (the unicode em-dash) would take the next paragraph as argument and put it in italics (or any format you want). %    any horizontal space you want. —Język wietnamski nie jest trudny. Thanks to all ideas given above, here's the easiest thing to do: Just put \kern 0.33em behind every "opening" dash (every other solution demands some editing throughout the document anyway). This produces: However to change the width, all the editing work will have to be done again. Not the answer you're looking for? Browse other questions tagged spacing or ask your own question. What is the easiest way to see default “spaces” with respect to “ex” and “em” in the book class? 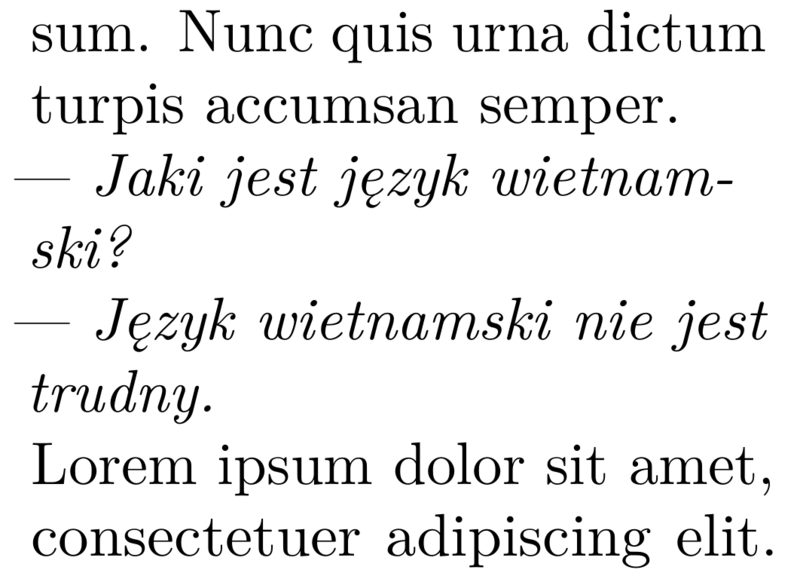 How can one produce spaces of arbitrary (fixed or relative) width that (do or don't) linebreak? What's the best way to typeset this space between table halves? What's the space between paragraphs?